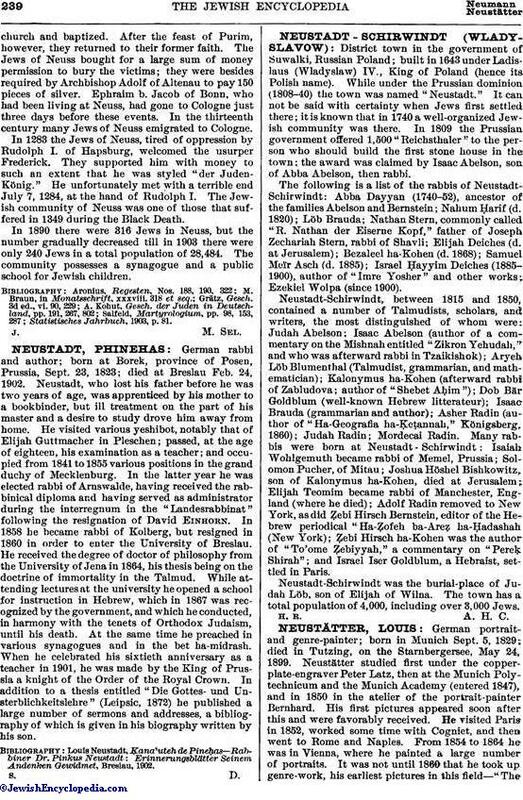 German rabbi and author; born at Borek, province of Posen, Prussia, Sept. 23, 1823; died at Breslau Feb. 24, 1902. Neustadt, who lost his father before he was two years of age, was apprenticed by his mother to a bookbinder, but ill treatment on the part of his master and a desire to study drove him away from home. He visited various yeshibot, notably that of Elijah Guttmacher in Pleschen; passed, at the age of eighteen, his examination as a teacher; and occupied from 1841 to 1855 various positions in the grand duchy of Mecklenburg. In the latter year he was elected rabbi of Arnswalde, having received the rabbinical diploma and having served as administrator during the interregnum in the "Landesrabbinat" following the resignation of David Einhorn. In 1858 he became rabbi of Kolberg, but resigned in 1860 in order to enter the University of Breslau. He received the degree of doctor of philosophy from the University of Jena in 1864, his thesis being on the doctrine of immortality in the Talmud. While attending lectures at the university he opened a school for instruction in Hebrew, which in 1867 was recognized by the government, and which he conducted, in harmony with the tenets of Orthodox Judaism, until his death. At the same time he preached in various synagogues and in the bet ha-midrash. When he celebrated his sixtieth anniversary as a teacher in 1901, he was made by the King of Prussia a knight of the Order of the Royal Crown. In addition to a thesis entitled "Die Gottes- und Unsterblichkeitslehre" (Leipsic, 1872) he published a large number of sermons and addresses, a bibliography of which is given in his biography written by his son. Louis Neustadt, Ḳana'uteh de Pineḥas—Rabbiner Dr. Pinkus Neustadt: Erinnerungsblätter Seinem Andenken Gewidmet, Breslau, 1902.